Open Age was established in 1993 and we’re now celebrating over 20 years of championing an active life for older people. We work across Kensington and Chelsea, Westminster and Hammersmith and Fulham to enable anyone aged 50 or older to sustain their physical and mental fitness, maintain an active lifestyle and develop new and stimulating interests. We provide a wide range of physical, creative and mentally stimulating activities to enable older people to develop new skills, fulfill their potential and make new friends. Our New Futures 50+ Employment Programme helps people over 50 to find employment. 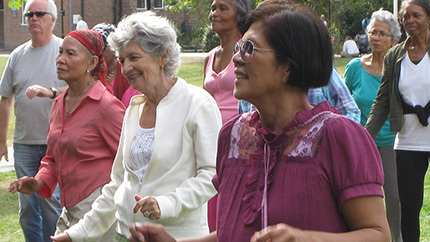 We provide over 350 weekly activities from more than 60 sites, including the New Horizons Centre in Chelsea, the Second Half Centre in North Kensington and the Avenues Centre in North Westminster, as well as community centres, sheltered housing, church halls and libraries across the boroughs we work in. Activities cover everything from health and fitness classes such as dance, yoga, chair exercise and walking groups to creative and performing arts sessions and weekly groups with speakers. We also have daily computer classes and drop-in sessions at our Open Age computer suites, as well as from other venues. An outings group arranges regular visits to attractions in and around London. There are facilitated telephone groups for those who are housebound and unable to leave their homes. 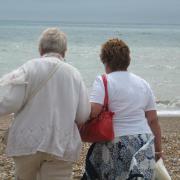 ‘Time For Me’ provides activities and trips out for unpaid carers. Link-Up staff work on a one-to-one basis and help people who are isolated attend our activities, breaking down the barriers that are preventing them leaving their homes. For further information please call us on 020 8962 4141.